For the last five years, my husband Joseph and I have had the honor and privilege of teaching TM to service personnel and Veterans in Southern Arizona. The changes we have seen have inspired us to do everything we can to make TM available to more and more military people. In this article, we invite you to meet some of our students and hear what they have experienced. But first, some background about the research on TM for Veterans issues. In 1985 a young doctor, Jim Brooks, at the Denver VA, did a study documenting what happens when Veterans (in this case, Viet-nam era Veterans) learned TM-Transcendental Meditation. TM is a specific and particular meditation technique that is easy to do and quickly effective. Veterans enjoy doing it because it is deeply relaxing. It doesn’t not leave the Veteran alone inside with whatever comes: rather, it lets the Veteran follow a clear set of directions and experience deep refreshing relaxation coupled with inner ease and peace. Dr. Brooks knew that Veterans enjoyed TM. They enjoyed being able to learn it easily, knowing that they were doing it correctly. And they enjoyed the feeling of relaxation and inner ease. But were they actually getting better? Should the VA include TM in its armory of tools to help heal the invisible wounds of war? Dr. Brooks randomly assigned Veterans to TM, or to psychotherapy (the VA’s standard treatment), and after 3 months he measured the results. They were striking. He looked at the amount of change that the Veterans in the two treatments had experienced. He found major changes in six areas key to Veteran. R.D. is a man in his mid thirties, a Marine Veteran who returned to civilian life over a decade ago. He and the mother of his son have loved one another since high school, but recently she asked him to move out because he was just not emotionally available at home, for her, their son, or their home together. After learning TM, R.D. found himself spontaneously responding to her and their child, He found himself picking up the clutter, fixing little things on the ‘honey, do’ list, noticing how she felt, listening better. She felt that her dear friend and beloved partner was back with her, actually emotionally available to build a family rather than being lost in the inner world of his battle experiences, or his self-medication to deal with that. For years, all through her military service, L.K. wanted to go to college. In fact, to earn the G.I.Bill was a major reason she enlisted. She retired after 8 years and three tours of duty in Iraq and Afghanistan and headed for college. But she found that the self-directed routine of college life was a huge contrast with the orderly life in the military. Plus her level of anxiety made completing assignments (especially oral assignments) and taking tests very difficult, sometimes impossible. So she was watching her dream of earning her degree fade away. She learned TM through her college Vet Center and noticed good changes almost immediately. Instead of spending her study time watching TM or surfing the net, she completed her assignments. And she found herself much less anxious about talking, and writing, for her teachers. 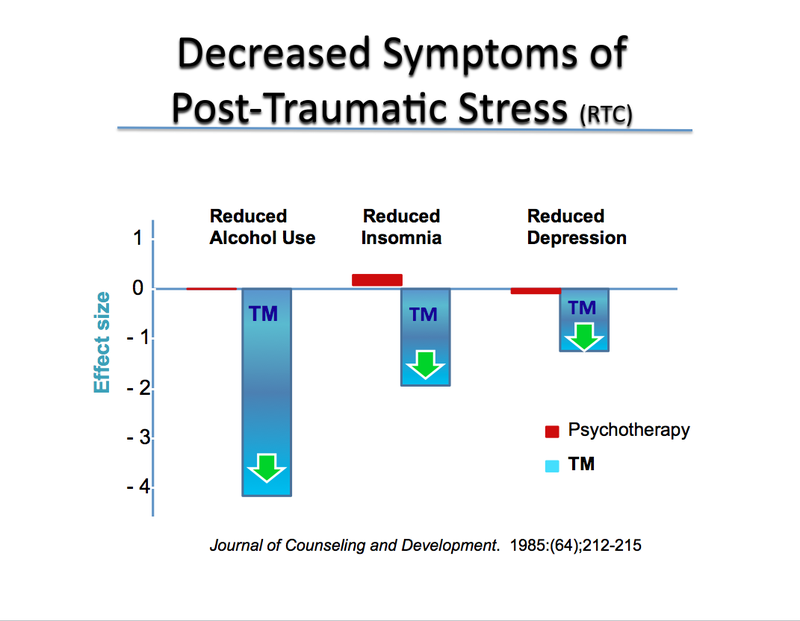 With her twice daily TM she can feel the stress of the day dissolve, and she is finding that the accumulated stress and PTSD from her military experience is also fading. Her grades are better and her goal of her college degree is back in her sights. The PTSD scale. What a cold, neutral name for what it measures—intrusive thoughts, nightmares, believing the worst about one-self or others, no confidence in who one is or what one does, the aftermath of significant trauma. H.S. enlisted at 18 and retired after 30 years and multiple deployments. As far as he was concerned, he was ‘fine’, but his PTSD scores said otherwise. His wife and family had adjusted to the changes his service brought, accepting them as part of their service with him. He was distant, taciturn, withdrawn, often lost in his own world. Sometimes his temper flared, often for no reason its target could understand. When he learned TM, he and his family were happy that he had learned something that would be good for his high blood pressure,. They all were thrilled when the shadow of his experiences in war began to recede, returning to them all the genial, happy man of his youth. C.W. is a single mother to very active two year old boy. She is very hardworking, wanting to create the best future for her and her son. But she couldn’t sleep, didn’t sleep. Medications didn’t really help—she wasn’t feeling rested, she couldn’t be that groggy and properly care for her son. Her son was quite difficult, acting out, not sleeping either. She learned TM in order to do better at her work, but within a few days she found that she was sleeping easily. She was going to sleep in a few minutes, sleeping through the night, and awaking refreshed. Her co-workers commented on how much more responsibility she could handle easily. And her son settled down—when she slept, he slept as well, and that good rest let him be a happy, comfortable boy, responsive to his Mother’s guidance. J.P. served for 20 years active duty and was completing 10 more years in the Reserves when a crisis at work ignited the sleeping trauma from deployment and left her deeply depressed and fearful of even going to work. She decided to learn TM because of the research documenting positive changes for highly stressed workers. Her first TM session was on a Saturday, and on Sunday J.P. reported that she had eaten a big lunch in complete comfort, the first meal she had eaten since the work crisis had thrown her into depression. A few days later she reported that she had driven onto base and not felt her entire body shut down from dread, as she had been experiencing since the crisis. Over the next few weeks her greater emotional availability and energy allowed her to navigate what she needed to do to handle the crisis and clear her name. The depression has not returned.